New York: Alfred A. Knopf, 1975. No. 1167 of 1500 copies specially bound first thus editions, signed and numbered. Hardcover. Near Fine/very good. Very collectible, scarce, heavy, clean, tight 8vo, 687pp + 26pp index. Book is near fine in special board covers designed by Paul Child. Dust jacket is neatly repaired and missing a 1" V-shaped open tear at the front tip and a narrow open tear across the head of the spine. Slip case is missing. Priced to accept these flaws. More scans if needed to serious buyers. 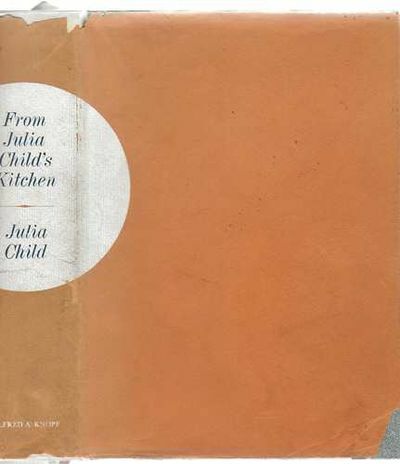 Delectable recipes for soups, entrees, appetizers, eggs, fish, poultry, meat, charcuterie, garden veggies, salads and summer fare, French breads, desserts, and fundaments - everything you would expect from the world famous Julia Child. A special copy for collectors.